Tracking Time to Fall Asleep. This is completely optional. You don't even need to install the AutoSleep Watch app to track sleep. This feature is designed for people that wear their Watch when sleeping. Because AutoSleep can't automatically know of your intention to decide to go to sleep you need to tell the app. What this does is send a timestamped event to the AutoSleep app. This is then used to calculate the time between this event and when the app detected that you fell asleep. It is designed to be used once per day, prior to your main sleep. Using this feature also tells the app to ignore any sleep prior to this point. This is done by using the 'Lights Off' feature. There are five ways to do this. The best method is to use the AutoSleep Watch app. If you have an iPhone 6s or higher, you can 3D touch the AutoSleep app icon. This will display the Lights off widget. You can add the Lights off widget to your Today View. Add to Siri in the Today tab. Create a Shortcut in the Shortcuts app that uses the AutoSleep Lights Off action. Note: In AutoSleep 6.1 you can also edit and retrospectively add lights off in the Today tab, Lights Off card. The Watch app is the best way to activate Lights Off. Either select Lights Off from the Watch app menu or scroll through the screens with the digital crown then use the big "Lights Off" button. When you do this it also starts a timer on the Watch to let you know how long you've been in bed. This timer is also displayed on the AutoSleep complication on your Watch face. In the Watch app it then displays your sleep progress. This will show you how much of the time you have actually been asleep versus in bed. Both the time asleep and time in bed are drawn on a progress ring based on your required sleep hours setting. To add the widget, go to your iPhone home screen, swipe your finger from left to right then press Edit on the Today view. If on an iPhone 6s or 7, you can also add quickly by 3D touching the AutoSleep app widget. Open the AutoSleep iPhone app. Unlock your iPhone any time after the notification time that you have setup in the AutoSleep wizard tab in the AutoSleep iPhone app. 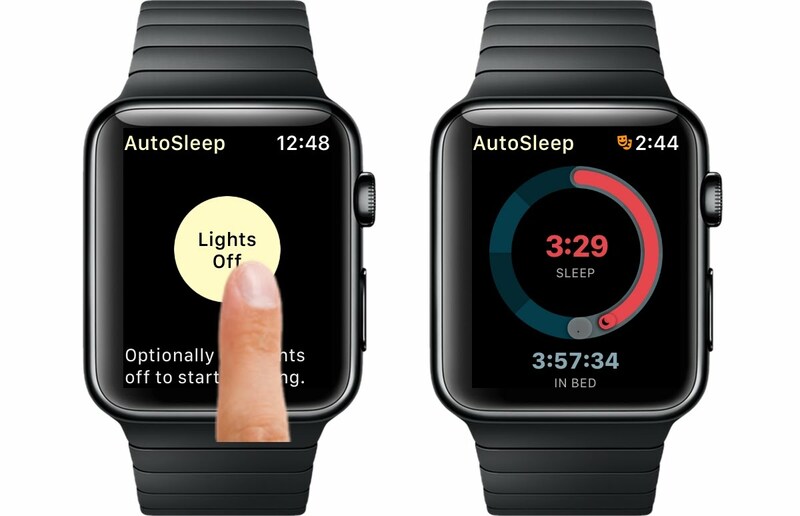 This will automatically turn off the timer in the Watch without you having to open the AutoSleep iPhone app. The Done button on the Watch will end the timer and show the main Watch screen. In the AutoSleep iPhone app, if you need to correct or remove the Lights Off entry, you can either touch the vertical yellow bar on the clock, or go into Day View and press the lamp button.